Surrender at 20: 1/14 PBE Update: Continued Hextech Crafting & Jhin testing, balance changes, Lunar Revel shop, and more! Following yesterday's massive update to start the cycle, a small update has been pushed to PBE! Today's update includes a few balance changes, a preview of the Lunar Shop, and continued testing for Jhin, Shen's champion update, and Hextech Crafting & loot ! Jhin, the Virtuoso testing continues! 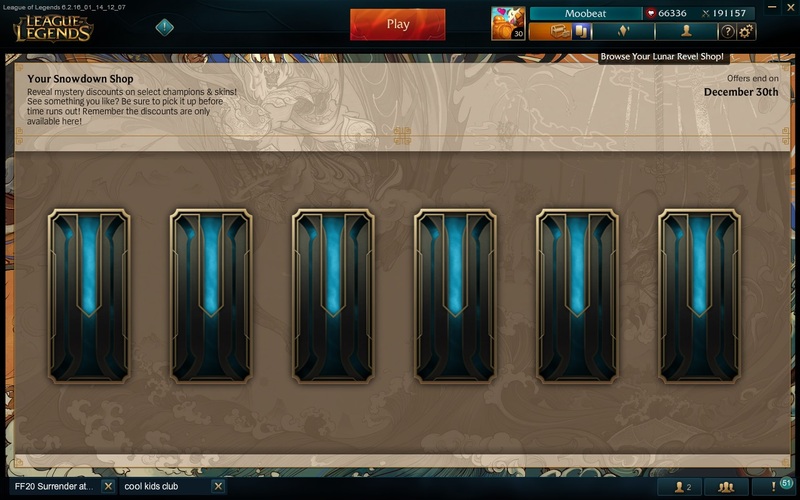 The Hextech Crafting & Loot system continues testing on the PBE! To follow up on yesterday's debut, here's a video opening over 40 chests and combining things in the new system! Look for more information? Check out the announcement post, another video preview, or check out our previous PBE coverage for a walkthrough. Feel free to drop any questions in the comment section! After his introduction in the 1/13 PBE update, Jhin continues his PBE testing performance! Check out our 6.2 PBE megathread for full details on Jhin, including kit details & scaling, his release skin, voiceover, and more! 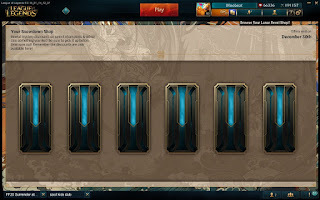 While we mentioned the new background yesterday, the Snowdown shop tab now says "Lunar Revel shop".